8 Ways to Simplify Your Shower Routine! 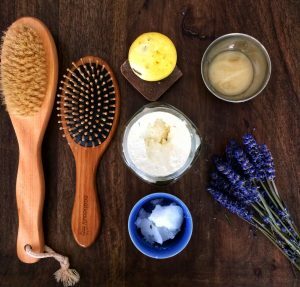 Dry Brush – Ditch that plastic luffa, it isn’t doing you or the planet any favours! Replace it with a reusable dry brush and use it before you hop in the shower. Did you know dry brushing helps to remove dead skin cells and improves blood flow? Talk about glowing skin! Bamboo Hair Brush – We’ve had one of these brushes for about 5+ years now – how’s that for longevity?! This brush gets bonus points for being gentle on hair and washable, which helps it last for years, rather than months! Solid Shampoo Bar – Such an easy swap, this little yellow gem provides the equivalent washes of 3 medium shampoo bottles, without the waste. Amazing, right? This one is from Lush, but we’re keen to discover a more local version…if you know of anyone in the Okanagan crafting solid shampoo bars, let us know! Coconut Oil – What can’t coconut oil do?? We love to use it as a conditioner for our hair, either before shampooing (if you have normal to oily hair [focusing on the ends]), or after (if you have very dry or damaged hair). It’s great as a shave oil too! Natural Bar Soap – We l-o-v-e the variety of natural bars of soap that can be found at local farmers/crafters markets! Be sure to keep a lookout for deals: often vendors will offer a discount if you buy in bulk! We look for the ones that are package free of course, which lets the natural beauty of the soap shine! Natural Raw Honey – Honey is the bee’s knees when it comes to waste conscious face cleansers, and easily found locally at markets or directly from the source! Work a quarter-sized dollop across your lightly wet face and lips, rinse with water for naturally glowing skin. Lavender or other natural elements – Replace harmful air freshener in your bathroom with natural soothing smelling elements like dried lavender, which I picked in the fall from my garden. Hope you’ve been inspired to evaluate your shower routine! If you have questions, tips to share, or local Okanagan businesses who we need to know about please leave us a comment! Ordinary people working together to empower others. Ditch the Tetrapak Soup & DIY!